French hate propaganda postcard from the series ‘The German crimes’. France: Third French atrocities report. Canada: £200,000 sub­scribed for MGs. Argonne: German advance at Hill 213. 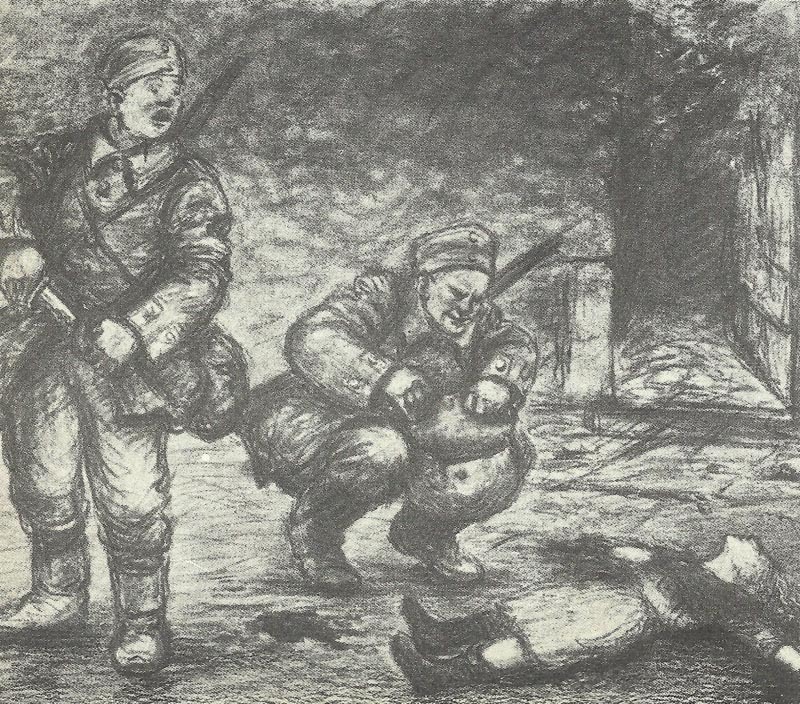 Berlin communique: ‘… by a surprise bayonet attack we occupied several enemy trenches, capturing four officers, 142 men and one machine gun’. Alsace­:Germans repulse attacks at the Lingenkopf and Barrenkopf. They explode mines under French positions at several points. Champagne: Petain arrives to prepare Second Army for Offensive. Isonzo: Italian advance near Mt Sei Busi, but driven back on Polazzo plateau. British Ambassador at Sofia informs Foreign Office that Bulgar Colonel Gancev has left for Berlin. Armenia: Abdul Kerim occu­pies Karakilise, but Yudenich has assembled Baratov’s 22,000 men and 36 guns for counter-stroke (July 30) that begins to outflank Turk advance on August 4. Gallipoli – Anzac bridgeheads: British 13th Division begins landing. East Africa: Germans raise Siege of Saisi until next day. General Tighe cables War Office with 20,000 estimate of German strength (in reality just 800 soldiers). Black Sea: Russians destroying so far 450 Turk sailing vessels. USA: Government receives German note on sinking William P Frye, accepts com­pensation on August 10.